The world's #1 salt chlorinator. Hayward's AquaRite® Salt system is the convenient alternative to conventional chlorine - bringing your pool the very best in soft, silky water with no more red eyes, itchy skin, or harsh odors. It’s remarkably convenient, too, automatically delivering chlorine for the ultimate swimming experience. AquaRite® is independently certified by the National Sanitation Foundation. And with the industry’s best warranty support plus 50% or more savings over conventional chlorine, no wonder it’s the World’s #1 salt chlorinator today. The answer is yes. If your above ground pool is composed of mostly resign (hard plastic) then you certainly can add a salt system to your pool. However, if your above ground pool is made of mostly metal components, then it is recommended that you do not put a salt system on it. 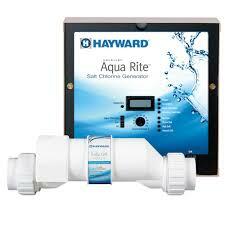 The type of systems we sell are valued by the amount of gallons in the pool. So, depending on the amount of gallons your pool holds, the cost can range from $800 to $2,000. The average salt pool owner will spend less than $100 per year in chemicals. They average chlorine pool owner will spend more than $300 per year in chemicals. The ocean has about 35,000 parts per million, and most salt systems are rated for 3,000 parts per million. The ratio in a salt pool is often compared to human tears. Since this is true, your eyes are less likely to be irritated under the water. As far as taste goes, it should only be an issue if you like drinking pool water. Since the salt ratio in a salt pool is 1/10 the ratio of the ocean you should not be able to taste the salt unless you lick your skin after being in the pool. The answer to this question is no, saltwater pools do not require more maintenance then regular chlorine pools. Like I mentioned before the cost of chemicals being bought is significantly less than that of a regular chlorine pool. This means that you are using less chemicals and spending less time on the maintenance of the pool itself. You should still be checking all the levels, but for the most part they should be stabilized, with a few exceptions like pH. The only real “issue” with the pool equipment (pumps, filters, etc.) is that the seals may perish faster. However, the amount spent on repairing these things is little compared to the amount saved by switching to a saltwater pool. If you have a vinyl liner pool the saltwater system can be less harmful on the liner itself, because you are having a constant flow of lower chlorine levels. In a regular chlorine pool you are continuously adding a high dosage of chlorine, a lot of times in the same spot, at one time, which can cause that part of the liner to degrade faster. If you have a fiberglass pool, the difference between chlorine and saltwater is insignificant on the wear and tear of the shell itself.